BROOKLYN, Iowa (CNS) — A mural of a grizzly bear breaking through a brick wall calls attention to visitors in the BGM High School gym. It seemed a fitting metaphor for the unstoppable spirit of Mollie Tibbetts, whose life was celebrated during a memorial Mass Aug. 26 in the gym. The 20-year college student, described as a bright light in this farming community of 1,500 people, was abducted and killed in July while jogging just outside of Brooklyn. Her disappearance led to a monthlong search that drew national attention and hundreds of volunteers determined to bring the young college student home. Farm worker Christhian Rivera, 24, has been charged with first-degree murder. He entered the U.S. illegally seven years ago, a fact that further fueled the immigration debate dividing the nation. But it was Tibbetts’ ability to bring out the best in others that brought 1,500 people to the memorial Mass, with Bishop Thomas R. Zinkula of Davenport, Iowa, presiding and five priests concelebrating. Adults and youths, Catholics, and non-Catholics, sang in the choir. A section of seats was reserved for the Class of 2017, Mollie’s class. Hugs were exchanged generously in that section and elsewhere in the packed gym. Tibbetts was raised in San Francisco and in her mother Laura Calderwood’s hometown of Brooklyn. It was in the small town where Tibbetts loved attending Mass at St. Patrick Church with her grandmother, Judy Calderwood. Tibbetts grew stronger in her faith during high school, Angie Gritsch, the parish’s director of religious education, said, adding that she loved kids and wanted to be a child psychologist. “Her peers looked up to her; she was a mom to everybody. She always had a smile on her face; she always had something good to say about somebody,” Gritsch said. Father Corey Close, St. Patrick’s pastor, led a prayer service after Mollie’s body was found and gave the homily at her memorial Mass. He said he saw Mollie “as a bright, shining light” and himself as “a dim bulb” who will benefit from having gotten to know more about the young woman preparing to enter her sophomore year at the University of Iowa. In speaking with Mollie’s parents, Father Close said the topic of the mustard seed came up. His heart was drawn to that passage, which he proclaimed in the Gospel at the memorial Mass. He said he saw a parallel between Tibbetts and St. Therese of Lisieux, a Carmelite nun of extraordinary joy and energy who died at age 24, but left a lasting legacy of faith and inspiration. “Who can say what good will come of what Mollie has already given the world? … I have already seen how her passing has touched lives, has changed lives. Look at the good God is working among us here today,” Father Close said. Giving eulogies after Mass were J.R. Glenn, one of Tibbetts’ high school teachers; her cousin, Morgan Collum; her brother, Jake; and her father, Rob. 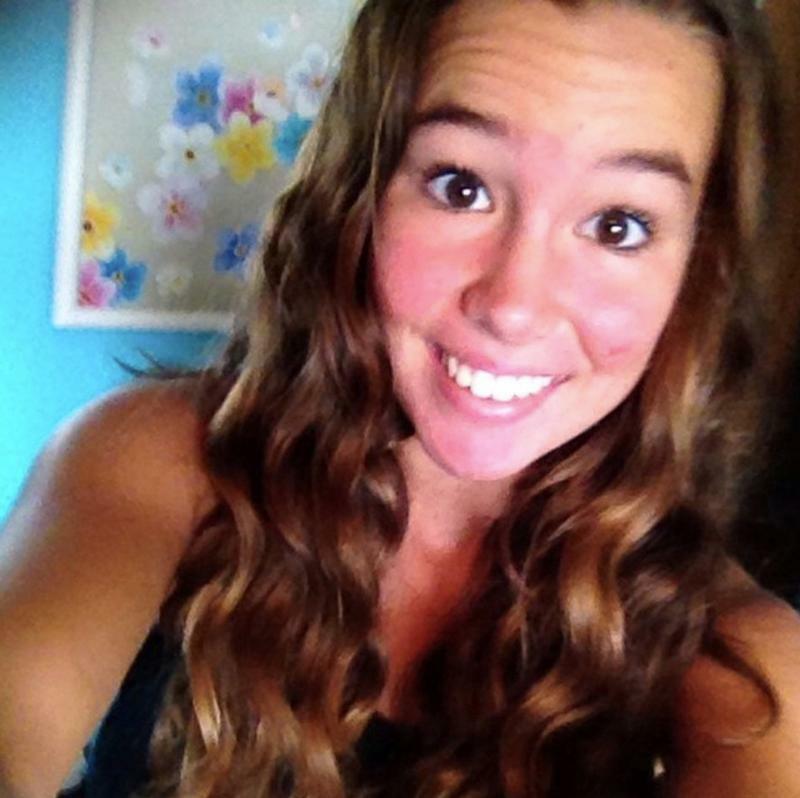 “Mollie’s my hero,” said Rob Tibbetts. He encouraged the gathering to turn to celebrating wonderful things: the football team and the wedding the day before of a couple in the assembly who he asked to stand up as everyone applauded. “That’s what Mollie would want,” he said. The elder Tibbetts also expressed gratitude for the community support the family received during the intense search for his daughter and paid tribute to family members and other for their roles in Mollie’s life. He also made a point of affirming Hispanics in the community, saying they are Iowans too, with the same values.